After watching Haleigh crash and burn, app developer Ian Henning makes her a proposition. If she'll provide honest feedback on his new dating app, he'll guarantee her a date to knock the socks off her former classmates. Even better, he—and the other Amarillo Sour regulars—will help her navigate the rocky road of dating. Through setups ranging from awkward to absurd, Haleigh discovers her matchmaker might just be better than the matches. And Ian wonders if she's the answer to everything he's worked for professionally. Or is she something much, much more . . .
As soon as I heard about this book I was curious about it, when it got discounted in price I finally took the chance and bought a copy. 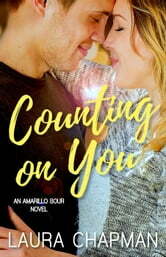 Counting on You sounded like a fun romance and when that was exactly the type of read I was looking for I picked it up. I had a fun time reading this book, the writing style is smooth and well done and I quickly got invested in these characters. Hailey is a math teacher who's still single and has no urge to chance it, but then her high school reunion is coming up, her ex is spreading rumors and she decided she needs a date for the reunion. One of her friends helps her set up a date and when that date doesn't go as well she runs into app developed Ian who wants her help testing his online dating app and that way she can find a date for her reunion. I have to admit I didn't really care for the whole finding a date for the reunion plot line, I wish Hailey would've just ignored what they thought of her and didn't let it get to her. But having said that I thought it did make sense and I understood that she did let it get to her. And I really liked how the reunion was handled in the end and it shows how much Hailey had changed throughout the course of the book. I liked the whole twist with her falling for the guy who was helping her find a date. Te matchmaker turning out to be her perfect match. Ian and Hailey were both likable characters. I liked how they both cared about their work a lot and had jobs they enjoyed, they had some common interest and they just meshed well together. From their first meeting and the banter it's obvious they are good for each other. They don't think of each other as a potential love interest for a bit, but it's fun to slowly see the idea pop-up and then grow into something more. The way Ian cared about Hailey and helped her with her dating was so sweet. I liked their romance, they had some fun banter and I liked how they both grow to care about each other and are also understanding of the other. The only part of the romance I didn't like was the bit of drama/ conflict that was added at the end, I felt it wasn't in character and it felt added just for the sake of drama. But besides that small part I thought the romance was well done, I liked how it developed and how these two communicated and were there for each other. The epilogue was great too and I also liked how the reunion plot line got resolved. There are also some likable side characters and I am looking forward to book 2, which will be the professor's story. I am looking forward to learn more about him and see who catches his heart. The bar Armarillo Sour played a big role in the story as well, it was the setting for a lot of scenes and I liked how the author creates a feel for the bar and its atmosphere. To summarize: If you're in the mood for a fun romance read I would recommend this one. This was a fun romantic read and the type of book I was in the mood for. I liked Haley and Ian, they're both likeable characters and I enjoyed getting to know them. I liked how they met while Ian was helping Hailey date and slowly they grow to feel something for each other. They made for a great couple. I also liked the bar Armarillo Sour and the atmosphere it had, it was the setting for a lot of scenes in the book. All in all I had fun reading this book and plan to read some of the author's other books too and am looking forward to book 2 in this series. Very well written. Enjoyed the story very much. Quite a unique angle.